Principal Deputy Assistant Secretary for Education and Cultural Affairs Jennifer Galt and Ambassador for International Religious Freedom Sam Brownback met with the Interfaith Dialogue and Religious Freedom Multi-Regional Project participants. 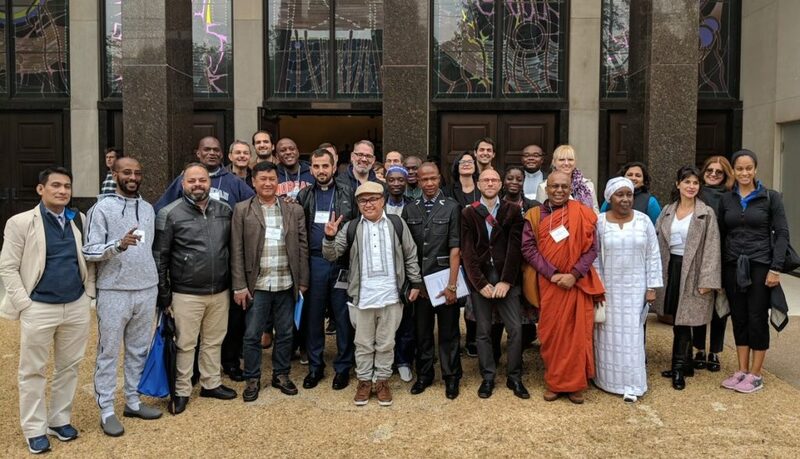 On October 15, Meridian International Center implemented, in partnership with the U.S. Department of State’s Office of International Visitors, a multi-regional project from 26 countries and representing all five major faiths on the theme of Interfaith Dialogue and Religious Freedom. 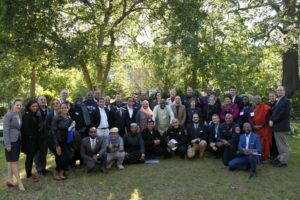 The participants concluded their program in Los Angeles, California on Saturday, October 26 – just as news of the Pittsburgh shooting at the Tree of Life synagogue was breaking. The previous Friday evening was spent in a Los Angeles synagogue, where the group attended a Shabbat service and shared a Shabbat meal. Upon returning to their respective homes, the IVLP participants reconnected over the tragedy in Pittsburgh using social media and collectively drafted the following statement. IVLP participants with speakers from an interfaith panel organized by Dr. Carol Flett of the Washington National Cathedral. That all people have the same right not to be the object of violence, persecution, discrimination and stigmatization. That governments, parliaments, judiciaries and national human rights institutions must take urgent action in this regard. That political, religious and community leaders, educators, the private sector, health professionals, civil society organizations and the media have an important role to play in education and prevention of acts of hate. As religious leaders, representatives of 26 countries around the world, we strongly reject any act of anti-Semitism, as well as reject any apology of hatred against Muslims, Christians, Hindus, Buddhists or any other religious or spiritual practice. That in order to prevent discrimination and violence against any group of people, we must continue to investigate, prosecute and provide reparations to victims of acts of violence, torture and ill-treatment; reinforce measures to prevent and report such situations of violence; and incorporate persecution, discrimination and hatred with reasons of religious affiliation as aggravating circumstances in the laws against crimes motivated by hatred and against incitement to hatred. Chacon Alvarado, Jose Pablo, Costa Rica. Dhammananda Thero, Rev Galkande, Sri Lanka. Emehel, Rev Fr Lawrence Chukwunweike, Nigeria. Mikhael, Ehab Abdelmalek Aziz, Egypt. Mojsilovic, Nadezda, Bosnia and Herzegovina. Sesay, Mohamed Ishaka, Sierra Leone. Robert D. Murphy, Vatican City. POST TAGS: Exchange, Interfaith Dialogue, International Exchange, International Visitors, IVLP, Meridian Alumni, Meridian Impact, Professional Exchange, Public Diplomacy, U.S. Department of State.